More often than not it is pretty difficult for me to gauge where a lot of teams are based on training camp whispers, ESPN reports, my own findings, and the like; so when I make predictions for the year sometimes it can get a little dicey. Despite all of that doing it is fun and I won’t let anything stop me from giving you who I think will rule supreme in the AFC and NFC. For you Browns, Bills, Jaguars, and Raiders fans hoping this site picked your team as a sleeper I’ll save you some time: I didn’t. For the rest of you wondering what I think of your favorite AFC teams read on and enjoy! Miami Dolphins (2013: 8-8, t-2nd in AFC East)- Miami went out and added Knowshon Moreno to a stable of running backs that wasn’t impressive in the lease last season. The key is still quarterback play, however, and if anyone needs Ryan Tannehill to take the next step in his progression its the Dolphins. This team was 8-6 before losing the final two games to close out the season. Don’t think improving on his performance down the stretch (44% completion, 1 TD, 3 INT’s) can’t be the difference maker. New York Jets (2013: 8-8, t-2nd in AFC East)- I think before I say anything about their prospects heading into 2014 I need to point out that I think Rex Ryan has shown he can be a very good head coach in the NFL. Perfect? Not a chance. But what he did in getting this team to 8-8 when they had no business doing that should be recognized. As for 2014 I’m still not a believer in Geno Smith as the long-term answer but he will have his opportunity to change public perception. The Jets have the defense and the look of a team that could go 9-7 if things go right for them. Buffalo Bills (2013: 6-10, 4th in AFC East)- Their defensive coordinator is now a head coach (Mike Pettine) and they lost Jarius Byrd to the Saints. The losses outweigh the additions (Sammy Watkins) and can’t make up for continued poor play at quarterback from EJ Manuel. It’s going to be hard for them to finish anywhere but the East cellar in 2014. Cincinnati Bengals (2013: 11-5, 1st in AFC North)- They’ve put all of their quarterback chips in the Andy Dalton basket for now, so they will need him to improve on what was a decent year last year. AJ Green, Giovani Bernard, and Marvin Jones are nice weapons on offense. Geno Atkins return from injury (among other injury returns) will make them dangerous on defense despite the loss of coordinator Mike Zimmer to Minnesota. Most complete team in the AFC North right now. Baltimore Ravens (2013: 8-8, t-2nd in AFC North)- A year after their Super Bowl victory the Ravens struggled to string together consistent efforts. This season they hope the addition of Steve Smith can give quarterback Joe Flacco a consistent weapon in the passing game along with the return of tight end Dennis Pitta. They will need Ray Rice to bounce back from a dreadful 2013 once he returns from suspension. They don’t have enough to win this division but a Wild Card berth isn’t out of the question. Pittsburgh Steelers (2013: 8-8, t-2nd in AFC North)- Mike Tomlin should start feeling the heat in Pittsburgh. It’s no wonder that the Steelers are reluctant to give quarterback Ben Roethlisberger an extension given the contracts they already have on the books. What should give them hope is that Markus Wheaton has looked good in the preseason, Antonio Brown isn’t making them regret letting Mike Wallace walk, and the backfield of Blount/Bell should do enough damage to make some hay in the playoff race. They won’t win this division, but the line between them and the Wild Card is about as thin as it can be. Cleveland Browns (2013: 4-12, 4th in AFC North)- The Browns were my dark horse playoff pick before Josh Gordon couldn’t figure his personal life out. I like the additions on defense to go with the scheme Mike Pettine is putting in place. As we witnessed in the preseason, though, this team is going to have a hard time moving the ball with any success if someone doesn’t step up at quarterback. They aren’t good enough on both sides of the ball to compete this season but they will still give you fits from week-to-week because of their defense alone. Think Buffalo Bills of the AFC North. Indianapolis Colts (2013: 11-5, 1st in AFC South)- 2012 was no more than a hiccup in the grand scheme of things for the Colts. Last year I heard scouts say a lot of things about Andrew Luck. One that stuck with me was a scout saying he wasn’t just the best player on this team or in the AFC, but the best player in the NFL. 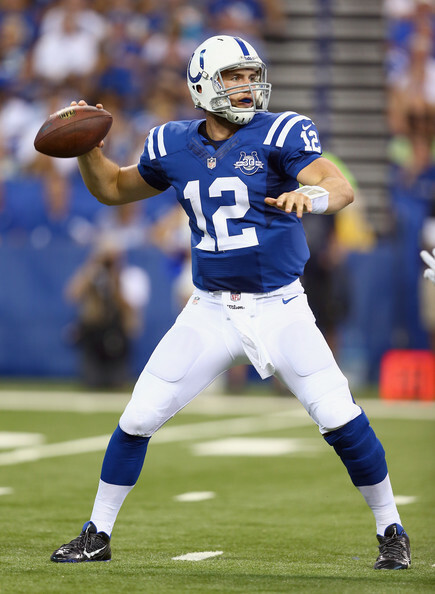 Andrew Luck is a perennial MVP candidate and they have talent in all the right spots. Chuck Pagano and his staff have done a remarkable job for sure, but as long as Luck is running this offense I can’t see any other team challenging them for top billing in the South. Tennessee Titans ( 2013: 7-9, 2nd in AFC South)- I think I might be higher on the Titans than most, but what they have is a team capable of sneaking into the playoffs. They almost pulled it off last season! They need Jake Locker to stay healthy. Period. Without him this team has no shot at the playoffs or even this high in their own division. Yes, he’s that important. Justin Hunter and Kendall Wright make for a good young receiving group, and newly drafted Bishop Sankey will split carries with Shonn Greene until he is ready to be the man in the backfield. Dark horse pick for sure, but I like their schedule, their new coach (Ken Wisenhunt), and the talent they bring to the table. Houston Texans (2013: 2-14, 4th in AFC South)- Former South darlings the Houston Texans are hoping their 2-14 2013 campaign was just a bump in the road. The Texans drafted Jadaveon Clowney with the number one overall pick in the draft and somehow coaxed Bill O’Brien away from Penn State to be their head coach. Too much talent for this team to go 2-14 again but it will take savvy decisions to get them in the playoffs. Jacksonville Jaguars (2013: 4-12, 3rd in AFC South)- A lot of the moves made by the Jaguars this offseason were, obviously, geared toward the future. They haven’t had a winning season since 2007 and won’t again in 2014. Blake Bortles looked good during the preseason but I am in complete agreement that him waiting behind Henne this season isn’t the worst idea. Denver Broncos (2013: 13-3, 1st in AFC West)- Super Bowl performance aside, this is the best team top-to-bottom in the AFC. Should run away with it. Kansas City Chiefs (2013: 11-5, 2nd in AFC West)- Stormed out of the gate in 2013 so they won’t catch anyone by surprise in 2014. I picked them to make the playoffs last year and expect the same this season. Stout defense, great running game, great coach, and a good quarterback has me high on them. San Diego Chargers (2013: 9-7, 3rd in AFC West)- Was anyone else sitting in a fantasy football draft and realize their were a lot of Chargers being chosen? Philip Rivers and co. have me believing once again they can make it a three team showing from the AFC West in the playoffs. It will be a battle for one of those two spots with the Titans, Ravens, Steelers, and Dolphins but I believe they ultimately prevail and snag one of those Wild Cards. Oakland Raiders (2013: 4-12, 4th in AFC West)- I will be writing on Derek Carr, but I am ecstatic to see what he will do now that he’s be named the starter in Oakland. I thought he was the second best quarterback in the draft and I think Oakland made the right call in playing him game 1. This team has talent, and I would be shocked if they go 4-12 again. Khalil Mack and the defense will help keep them in games and they could be in 7-8 win territory before we know it.